In traditional Chinese culture, fish is the symbols of fertility and wealth. Fish images are also often to given as wedding gift as fish multiply rapidly and they often swim in pairs. Chinese Fish Painting: In China, "fish(鱼)" and "surplus(余)" and "jade（玉）" are homonymic words (all sound "yu"), so fish represents affluence and abundance. China artists often draw the auspicious fishes drawing as carp and goldfish, as "carp(鲤)" and "benefit(利)" are homonymic words in Chinese, and "gold(金)" represents weath, so they often relate to the business and symbolize the advantages and benefits in business. Lotus Flower & Fish Fengshui Painting: represent that you live in affluence and every year may you always get more than you wish for. Peony & Fish Feng Shui Painting: peony is symbolic of honour and riches, so the picture combination of peony and fish mean you become wealth in affluence and abundance. Two(2) Fish Painting: In particular a Black/ Blue Fish and a Red / Gold/ Colored Fish frolicking in water resemble the black and white areas of Taiji ("great ultimate"). 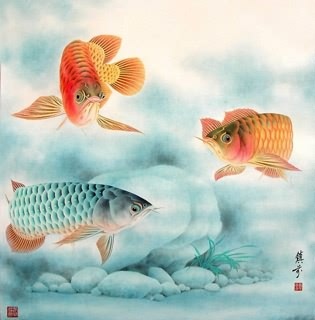 So two fish paintings or scrolls can represent "yin" and "yang" and has very auspicious meanings. Six(6) Fishes Painting: symbolizes "may everything goes according to your wishes".